While we still hear about positives of new diet drinks that taste just like the original (praise Splenda) and how large amounts of caffeine can be bad for the body. I tend to lean to diet drinks for the silly notion that I'd rather put calories in my body through food than drink. I also have been told to cut my caffeine for several reasons including a neat little eye twitch that I get here and there (just not as bad as South Park's Tweek.) So I tend to like diet drinks like Diet 7-up, caffeine Free Diet Coke and several other variants. But, I'd like you to look in your local 7-11's, AM/PM's and Stop 'N Slop's (ok, I made that one up but any type of convenience store) and see how many items you can find that don't have calories and caffeine. There are hardly any but usually if there is a demand, there is a market but not if there is one whole shelf dedicated to just Coke or Pepsi. 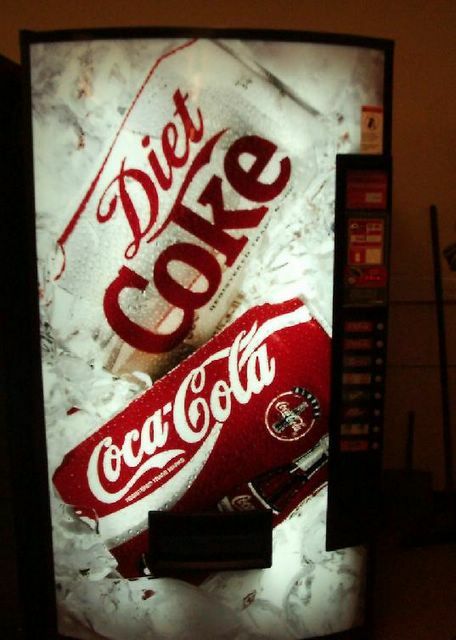 Sales stats have shown that Diet Coke is outselling Coke yet... there are more spots for Coke. Vending machines do the same thing. 3 buttons for the original and one for the diet version. Makes me think that either they don't know their public or that they know what they want the public to consume and are limiting the availability of the options. I will often drive far out of my way to the one convenience store that I know carries Diet Vanilla Coke. Hardly any of them do. I think the marketing departments need a refresher course. I try to avoid the whole diet coke thing and drink tea. It saves a lot of time. I actually have a thing for the Blueberry No Carb Arizona Ice Tea. Come to think of it... I don't think that I have a favorite drink. That's kinda lame. I think the cola companies feel bad that people are actually drinking that "poison" that they put in diet drinks and are hoping not to have too many lawsuits like the tobacco company. So they make regular sugar sodas more readily available in hopes on cutting down on losing money in the long run. So... what should we drink ? Give us some ways out of this thing.... will u ?